Rebecca Rego Barry’s Rare Books Uncovered: True Stories of Fantastic Finds in Unlikely Places (2015) is one of the finest books about books ever written (and I’m not just saying that because one of my stories is featured within). This book is a genre busting mix of Nicholas Basbanes style biblio-journalism, John Carter-esque ABC of Book Collectors, Richard Altick’s The Scholar Adventurers, and the irresistible details found in classic bookseller and collector accounts authored by the likes of A. Edward Newton, Charles Everitt, and David Randall. Heady company. I can think of no other book that is a better introduction to the culture of book collecting, nor one that so concisely captures the wide range of book hunting and the associated enthusiasm which enraptures the participants. The book’s primary focus is on the adventures of fifty-two individuals. But intertwined amongst their stories is a multi-layered view of book hunting that exemplifies the breadth of the field. I anticipated a good read—which it certainly is—but about a third of the way through the book I felt a growing sense of excitement akin to discovering a favorite dish for the first time. Barry is a master chef seasoning the stories with information about the items, providing background and context, and she digs deep into a number of the controversial stories with first-hand interviews, revealing new facts, and shows a penchant for behind-the-scenes details (including prices paid) that are rarely encountered. Some examples of this digging are her chapters on Eric Caren and the deaccessioning of New York Public Library material (Ch. 32) and the discovery of the Richard Greener papers (Ch. 43). While Barry is accomplishing this, she is also threading throughout her book tapestry the varied approaches taken by book hunters. We see an insider’s glimpse at negotiating and reselling techniques used by scouts and dealers, the sometimes wily ways of determined collectors, and plenty of advice from advanced bibliophiles. She even morphs into the aforementioned John Carter at times, defining book terms separately within the essays. And did I mention enthusiasm? The passionate pursuit, the rush, the thrill of discovery--whether physical or factual—is amply represented here. This critical element is often downplayed by those of too serious a bent, but in truth, it underlies every great bookish endeavor. The whole eco-system of the wonderfully peculiar book world is revealed by Barry. No less an achievement is the accessibility of the book to a variety of readers. A general reader with a literary inclination will find it entertaining; a book hunter who is frustrated that relatives, friends, or co-workers think him or her a bit nutty can offer this book in self-defense; a beginning collector will learn much in taste and technique and draw inspiration; and an advanced book hunter will enjoy not only the details involving current players in the field but also the armchair chance to step out of one’s focused circle of interest -- perhaps sparking new avenues of pursuit. Do I have any quibbles with this newly minted classic? Only a few and they don’t spoil the dish. There is some repetitiveness that is naturally going to occur in a work compiling fifty-two stories within the same general theme. The order of the stories occasionally appears haphazard but then again how does one group such an exercise? One final quibble, mentioned because of my distinct focus on the books about books genre, is a wish that the selected reading list was meatier and not so random. That, however, could be an easy fix for the next printing. All these points pale in comparison to one major “Thank God” kudos – the inclusion of a detailed index that allows easy access to the book as a reference work. Barry’s position as editor of Fine Books and Collections magazine has her fully immersed in the book hunting world on a grand scale. If not a unique perch, it is certainly a rare vista, and we should all be grateful that she found the time and enthusiasm to write this book. And patience, too, as I would guess dealing with all these book hunters and their stories must have been akin to the proverbial herding of cats. Rebecca Rego Barry. 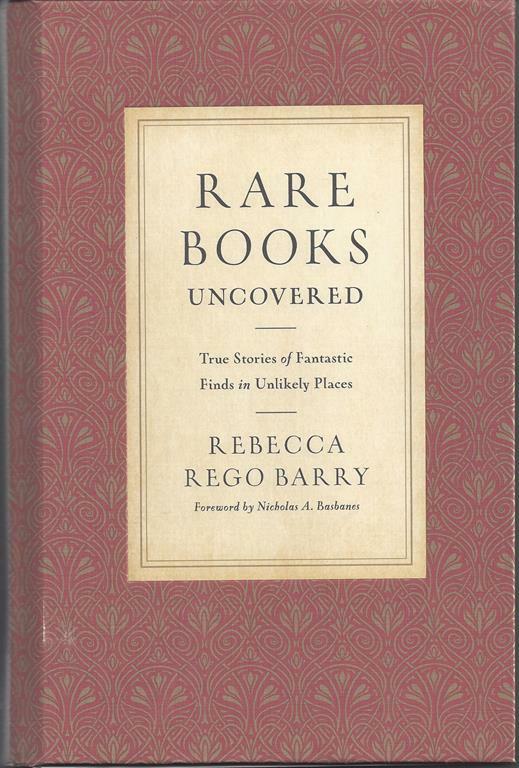 Rare Books Uncovered: True Stories of Fantastic Finds in Unlikely Places. Minneapolis: Voyageur Press, 2015. Foreword by Nicholas A. Basbanes. $25. For anyone interested in further biblio-reading see my article, “Armchair Adventures: Ten Classic Accounts of American Book Collecting,“ in Fine Books & Collections, November / December 2007. I highlight ten books to read and provide a brief essay on each. The authors include Nicholas Basbanes, Edwin Wolf & John Fleming, Henry Stevens, David Randall, Wilmarth Lewis, Charles Everitt, Matthew Bruccoli, Lawrence Clark Powell, A. Edward Newton and Margaret Stillwell. Many other books are mentioned in the essays and the magazine put additional information from my article online. The article is due for an update which I plan to publish on my blog early next year. A most excellent review of a book that if so highly praised by you will be a definite read.